Made In ChinaYou can’t go about storing and transporting your ammunition all willy nilly, like some kind of barbarian would. Cartridges of any quality deserve to be housed within the dignified confines of a mil-spec ammo can. We feel this way strongly, so we keep just such an ammo can in stock and ready to accompany any our fine ammo that ships out. This ammo can greatly immunizes its contents against the corruptive influences of rain, atmospheric moisture, dust, and windborne soil. Its strong latch ensures that its lid’s gasket presses closely against its walls, making it all but waterproof to prepare for the most trying weather conditions you could encounter. 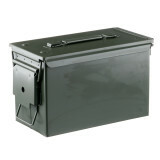 This ammo can is particularly spacious, as it is designed to store 50 Cal rounds for the M2A1 heavy machine gun. As such you may store up to 700 223 Rem cartridges in it, or significantly more smaller ones. It’s the perfect accomplice to any ardent handloader who respects their work too greatly to place it in a plastic baggie, and loosely packed bulk ammo absolutely demands it. Order yours today! It locks tight, sealing out water and moisture, allowing you to keep bullets in great shape for a longer period. 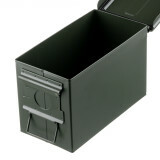 This is the box you need for your handgun, rifle, or shotgun ammunition. These boxes are trusted by the U.S. military, so you know they’ll meet your high standard as well. Before you head to the gun range, make sure your ammo is protected by ordering one of these boxes. 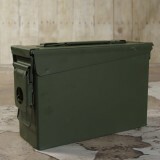 If you stock plenty of ammo for a day of target shooting, then this box will help you transport your supplies with ease. 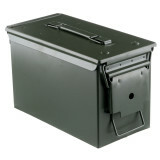 Don’t trust your expensive ammo to the cardboard box it came in, get this military-spec ammo can today!